Click here for the Regal Rondels Recipe. 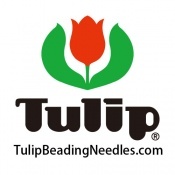 See Youtube channel Carol Cypher with Tulip Beading Needles for beadwork projects. Dec 30, 2015 Youtube video of Sparkling Shoko Bracelet is ready for veiwing. The recipe for it and the expanded version called Regal Rondels Bracelet can be found under "Articles". Happy New Year! Click here for the recipe that accompanies the video of Tulip Bangle bracelet.